Contacts with 5 DL stations and with 5 JA stations each with a different prefix (e.g. DL1, DF2, JA5, JH6, etc.) are required. Furthermore, at least one QSO with a JAIG-member of any country must be confirmed. The text "DL JA FREUNDSCHAFT" is to be formed by using the suffix letters of confirmed QSOs. At least one QSO a JAIG-Member is mandatory. Each QSO with a JAIG-member may be used as a wild card (joker) for a missing letter in the above text, whereby the suffix letters are also eligible. All QSOs made since the year 1985 on any amateur band and by any mode are recognized. A JAIG member list can be obtained from the award manager (please enclose an SASE). 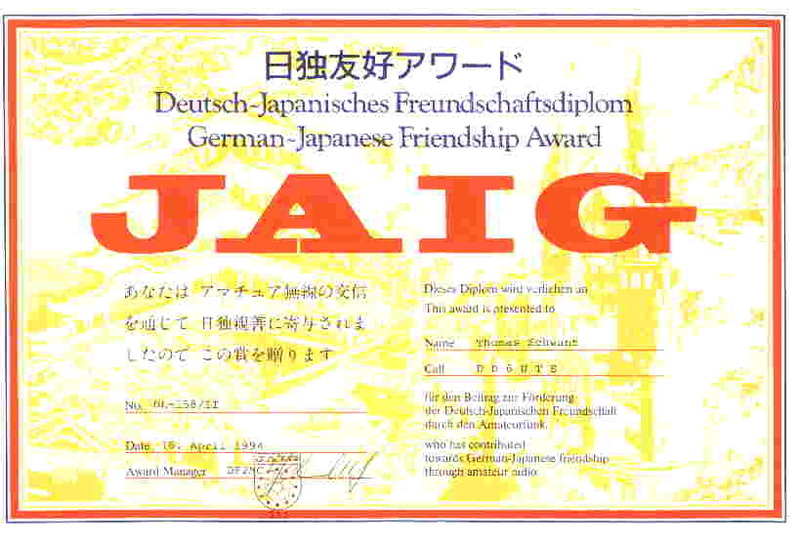 The JAIG group was foundet in DL in 1985, with the aim of promoting friendship between German and Japanese radio amateurs with paticular emphasis placed upon contacts between Japanese members who live in DL. The JAIG group is also open to amateurs of other European countries. The JAIG-net is operated every Sunday at 08.00 UTC on 21.360 MHz.